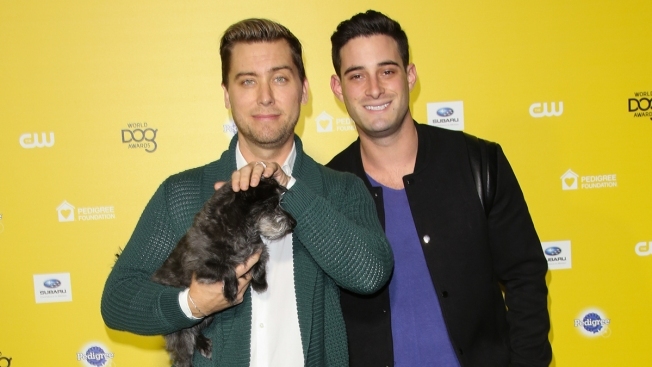 This Jan. 10, 2015, file photo shows Lance Bass (left) and Michael Turchin with their pup Lily at the World Dog Awards in Santa Monica, California. Lance Bass took to social media to share the loss of his dog Lily and offer some words of warning to fellow pet owners. "It is with an extremely heavy heart that I share the passing of our baby girl Lily. Lily was one of a kind. More human than dog. She really was so perfect. She will be painfully missed. We love you Lily Dimples," Bass wrote underneath a video and two photos of Lily. It is with an extremely heavy heart that I share the passing of our baby girl Lily. Lily was one of a kind. More human than dog. She really was so perfect. She will be painfully missed. We love you Lily Dimples. For those that live near coyotes, please triple check the safe areas they get to roam free. Our backyard was “coyote proofed” with rollers and all and they somehow leaped over all of it. They also can dig under fences. The entertainer and former N'SYNC member went on to alert people of the dangers of living near coyotes. "Please triple check the safe areas they get to roam free," Bass said of the animals. "Our backyard was 'coyote proofed' with rollers and all and they somehow leaped over all of it. They also can dig under fences." Bass did not specifically say Lily was attacked by a coyote. But a representative for Bass wrote in a statement to People that "he let her out to drink some water two nights ago and she must have been snatched up within 30 seconds. They went to get her two minutes later and couldn’t find her. There wasn’t a sound in the backyard. Lance got into his car and drove down the street where he saw a pack of coyotes and saw Lily in the mouth of one. She was already gone." Actor Michael Turchin, Bass' husband, also mourned the loss of their pup. "Words will never be able to describe how much I loved you these past 7 years of my life," he wrote. "You made me smile more than anyone or anything in this world and your sudden loss is so sad and so unfair bc you had so many more years ahead of you to be loved and give love to so many. I know you’re in a better place now my Lily Dimples, and if you’re up in the sky looking down at me and lance and your little brothers just know that we will continue loving you forever and ever—you were one in a billion. Till we meet again my beautiful girl." Lily was used to the attention on her owners. She had accompanied Bass and Turchin to the 2015 World Dog Awards, even joining Bass onstage while he presented an award. Bass and Turchin also have two other dogs named Chip and Dale.